QSO Tournament Studio. 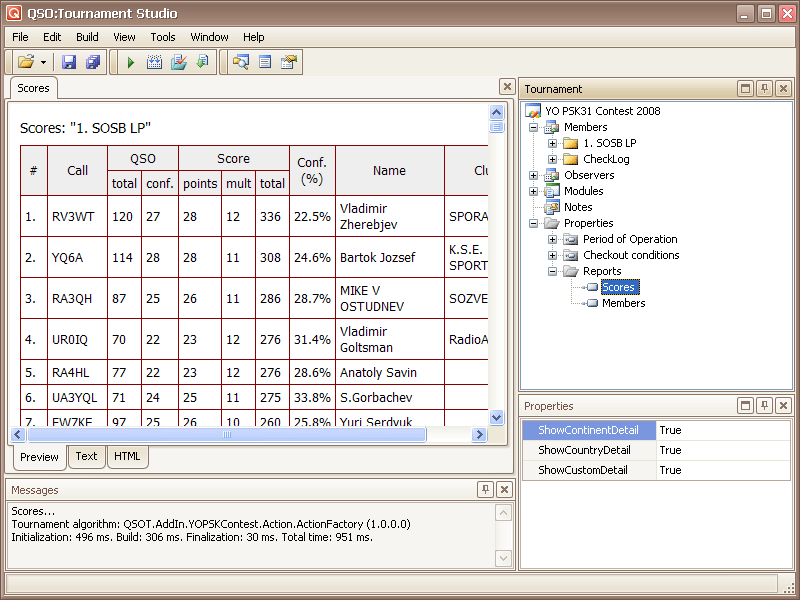 Radio-contest control software. 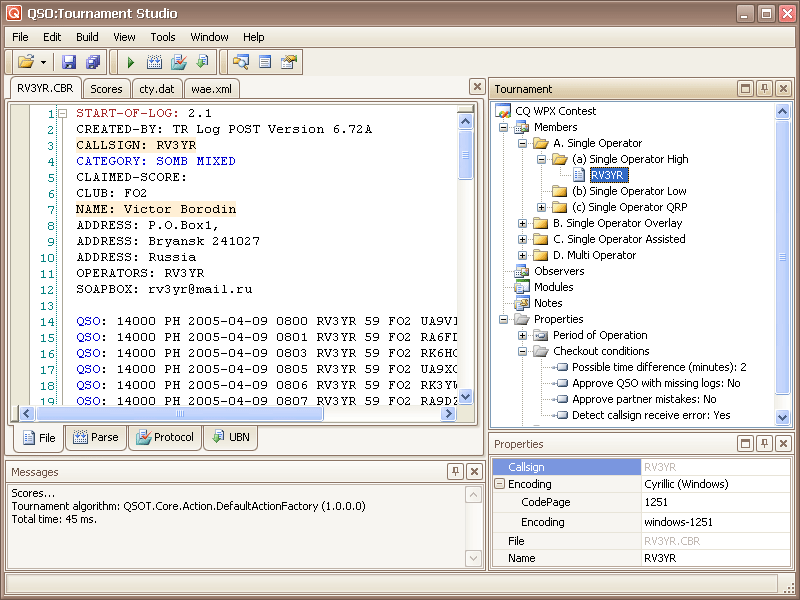 QSO Tournament Studio is a radio-contest control software. It is intended for automation refereeing of radio fans competitions on the basis of the files-reports presented in format Cabrillo (*.cbr). 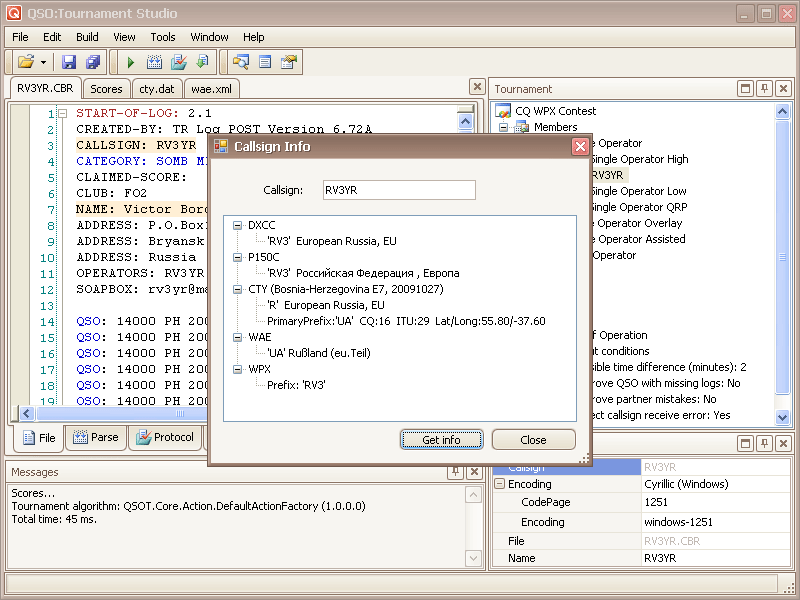 Processing of files of other formats is possible. 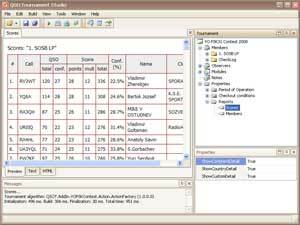 Provides processing of dens and formation of files with results. This is a program for Microsoft Windows and required .Net Framework 2.0 and above. The program is developed for automation of refereeing of any radio competitions thanks to application of specially developed and connected algorithms of processing. Localization of the user interface (versions in Russian and English language are accessible) is supported. Contains actual directories CTY, DXCC, WAE, Р150С for use in algorithms of competitions, supports QTH-locator processing (Maidenhead Locator). Forms total reports and personal reports for participants of competitions: 'Claim' - contains the summary information of file, the information of its Category, predesign result (ClaimedScore), 'Protocol' - with the full analysis of calculation of points and errors, 'UBN' - result and the short list of errors. Reports are formed on freely created groups of participants (test categories).